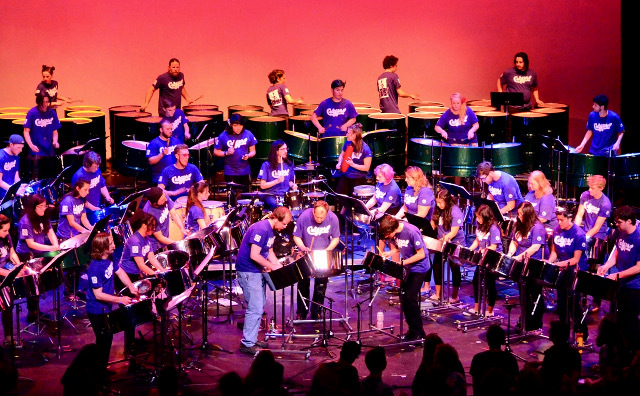 Humboldt State’s Percussion Ensemble will play an evening-long concert featuring a spectrum of music for percussion, from the contemporary music of Europe to the exciting drumming rhythms of West Africa, and from the profound grooves of the Brasilian Samba to the festive steel drum sounds of the Calypso tradition of the Caribbean. The HSU Calypso BandDirected by Department of Music professors Eugene Novotney and Howard Kaufman, the performance will take place Saturday, Dec. 2 at 8 p.m. in the Van Duzer Theatre. The Percussion Ensemble will play works by Edgart Kopetski (“Chant of the Serpent”), Mark Ford (“Head Talk”), and John Bergamo (“Piru Bole”). The first half of the show will end with a suite of traditional Mandeng Drumming of West Africa, and an inspiring arrangement of traditional Brasilian Samba using all indigenous instruments. In addition, the Calypso Band will perform the world premiere of a brand new arrangement of Tito Puente’s “Philadelphia Mambo” written by local Afro-Cuban master drummer David Peñalosa. The performance will feature Peñalosa as the timbale soloist, performing the role that Puente defined so well throughout his 50-year career performing Latin jazz music in the U.S. The concert takes place on Saturday, Dec. 2 at 8 p.m. in the Van Duzer Theatre. $10 general, $5 senior/child, $3 for HSU students with ID.